I must apologize for being a little tardy in posting this week but this kitchen had to get her act together after an exeptionally festive holiday weekend. The theme to this week’s post was never far from the brain, however, considering thyme was in so many dishes in our Thanksgiving feast. Having already clocked lots of kitchen time this weekend I knew whatever I made to highlight thyme also had to be simple, delicious, easy fare. Maybe it was all the turkey talk or maybe I was inspired by Chef Jonathon Sawyer’s “40 clove” chicken I had recently at the Greenhouse Tavern but I truly had bird on the brain – I thought a roast chicken with lots of thyme might be just the ticket. So off to Whole Foods I went to pick my organic, free range, no harmfullness added little chicken. I tracked down a Thomas Keller recipe for his favorite roast chicken and I figured I could not go wrong. From there it was pretty simple – preheat the oven to 450°F, rinse the chicken and then dry it very well using paper towels, inside and out. Salt and pepper the cavity and then truss the bird. I did a sort of half-truss due to the lack of kitchen twine readily available. I tucked the little guys wings in and fastended the legs. Keller then says to salt the bird by “raining salt” over it – creating a crisp, salty, flavorful skin and then pepper to taste. I placed him in a little roaster and set him in the heated oven. Following Keller’s advise implicitly I did not touch the bird after that – he doesn’t believe in basting or buttering – his key to a juicy bird: the less it steams, the drier the heat, the better the bird. The chicken took about 60 minutes to roast and then came time for the thyme. 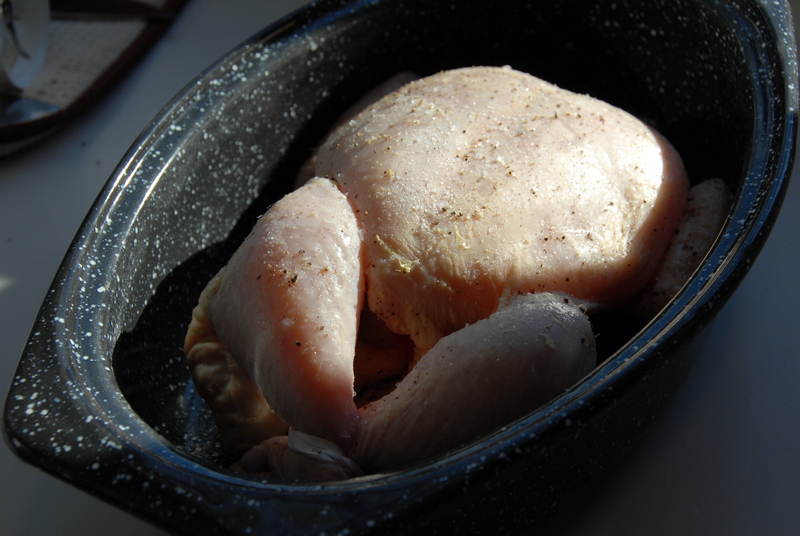 Keller suggested placing the minced thyme directly into the pan juices and then basting it over the chicken. Let me tell you, the result not only looked beautiful but the smell was intoxicating. The flavors seeped into the meat and clung to the skin, I had to remove myself from the kitchen so not to attack the bird at once – I had to let it rest for about 15 minutes before sneaking a bite. The chicken was incredibly juicy and perfectly showcased thyme. For being such a simple recipe, the result was absolutely dynamite. 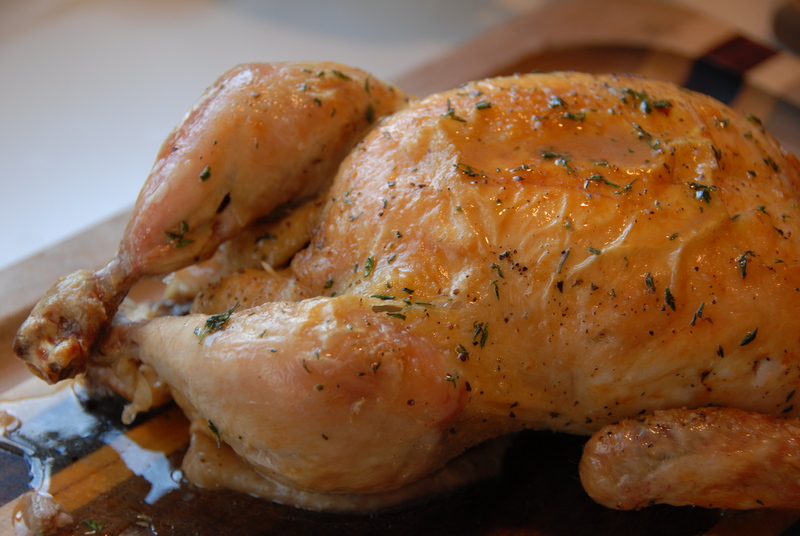 This entry was posted in Thyme and tagged basting, chicken, Jonathon Sawyer, roast, Thomas Keller, thyme. Bookmark the permalink. Yum! This sounds delicious. I plan to make asap. What a great simple meal for a winter’s eve. Also – great photos. Food stylist? I think so.